Dear LiftMaster® Partners: On April 28, at approximately 3 p.m. CDT, a software bug in our MyQ® service delivered inaccurate push notifications to our consumers. We quickly isolated the issue and full service was restored later that evening. Parse, MyQ’s push notification provider, implemented updated software to our service at 3 p.m. CDT which contained a bug triggering the delivery of five inaccurate push notifications to our MyQ users. This was not a system hack or security compromise, it was a software complication which has since been resolved. Working alongside Parse, we identified the root cause and isolated the problem; partial services were restored to customers by 7:56 p.m. CDT, and full MyQ services were restored by 11:50 p.m. CDT. We are continuing to monitor the performance of our service to ensure it is back to its normal, reliable state, and are taking the necessary steps to avoid this in the future. At LiftMaster, we take the safety and security of our customers very seriously – these are our top priorities We appreciate the steps many of you took to proactively engage with customers by phone, by email and on social media channels. We hope the direction and messaging we provided via Facebook and Twitter was helpful in mitigating concern. We’ll continue to communicate with customers through all mediums (social channels, Technical Support hotline and website) through the end of the week. If you receive more probing inquiries or need any clarification, please refer people to CGI's Technical Support Center (Tucson) at 800-528-9131. 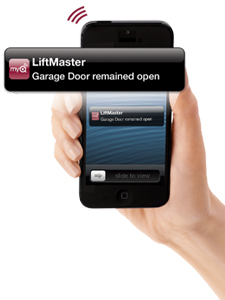 MyQ is the technology from Chamberlain / Liftmaster which allows users to control their garage door from an internet connection or iPhone or Android app. We use the MyQ features regularly and have found that most customers who have upgraded their garage door opener to MyQ (available for Chamberlain/Liftmaster/Craftsman openers mfg after 1998) via the 888lm console and 828lm internet gateway OR by purchasing a new garage door opener find the new features very useful. Visit our website at www.gdcorp.com for details and instructions.